A deep-space robotic emissary from Earth is continuing to carry out its extraordinary mission at a distant dwarf planet. Orbiting high above Ceres, the sophisticated Dawn spacecraft is hard at work unveiling the secrets of the exotic alien world that has been its home for almost two years. 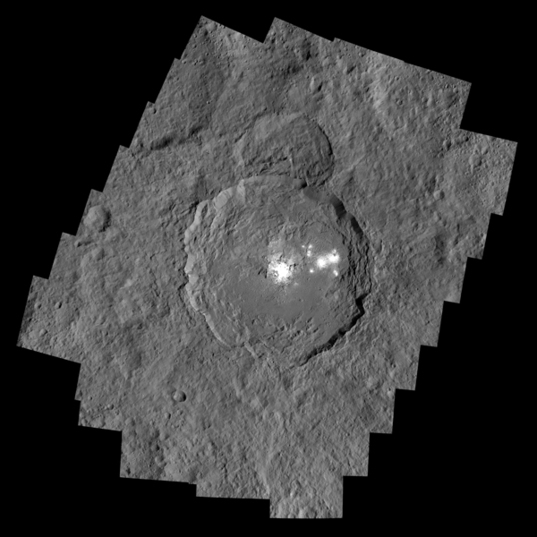 Dawn’s primary objective in this sixth orbital phase at Ceres (known as extended mission orbit 3, XMO3 or "this sixth orbital phase at Ceres") is to record cosmic rays. Doing so will allow scientists to remove that "noise" from the nuclear radiation measurements performed during the eight months Dawn operated in a low, tight orbit around Ceres. The result will be a cleaner signal, revealing even more about the atomic constituents down to about a yard (meter) underground. As we will see below, in addition to this ongoing investigation, soon the adventurer will begin pursuing a new objective in its exploration of Ceres. Dawn took this picture of Ikapati Crater on Jan. 24, 2016, from an altitude of 240 miles (385 kilometers), which is orbit 4 in the figure below. (Ikapati is an ancient Tagalog goddess whose name means "giver of food.") The 31-mile (50-kilometer) crater is geologically young, as evidenced by its clear, strong features. 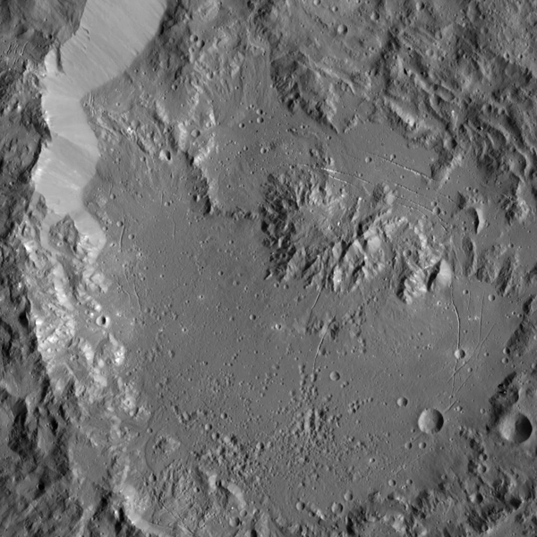 Note the difference in topography between the crater floor in the top half of the picture, with its many ridges, and in the bottom, which is smoother. The fractures run in different directions as well. Ikapati is at 34°N, 46°E on the map below. Full image and caption. As we saw last month, the angle of XMO3 to the sun presents an opportunity to gain a new perspective on Ceres, with sunlight coming from a different angle. (We include the same figure here, because we will refer to it more below.) Last week, Dawn took advantage of that opportunity, seeing the alien landscapes in a new light as it took pictures for the first time since October. This illustrates (and simplifies) the relative size and alignment of Dawn’s six science orbits at Ceres. We are looking down on Ceres’ north pole. The spacecraft follows polar orbits, and seen edge-on here, each orbit looks like a line. (Orbits 1, 2 and 6 extend off the figure to the lower right, on the night side. Like 3, 4 and 5, they are centered on Ceres.) The orbits are numbered chronologically. The first five orbits were circular. Orbit 6, which is XMO3, is elliptical, and the dotted section represents the range from the minimum to the maximum altitude. With the sun far to the left, the left side of Ceres is in daylight. Each time the spacecraft travels over the illuminated hemisphere in the different orbital planes, the landscape beneath it is lit from a different angle. Ceres rotates counterclockwise from this perspective (just as Earth does when viewed from the north). So higher numbers correspond to orbits that pass over ground closer to sunrise, earlier in the Cerean day. (Compare this diagram with this figure, which shows only the relative sizes of the first four orbits, with each one viewed face-on rather than edge-on.) Click on this image for a larger view. Dawn takes more than a week to revolve around Ceres, but Ceres turns on its axis in just nine hours. Because Dawn moves through only a small segment of its orbit in one Cerean day, it is almost as if the spacecraft hovers in place as the dwarf planet pirouettes beneath it. During one such period on Jan. 27, Dawn’s high perch moved only from 11°N to 12°S latitude as Ceres presented her full range of longitudes to the explorer’s watchful eye. This made it very convenient to take pictures and visible spectra as the scenery helpfully paraded by. (The spacecraft was high enough to see much farther north and south than the latitudes immediately beneath it.) Dawn will make similar observations again twice in February. As Dawn was expertly executing the elegant, complex spiral ascent from XMO2 to XMO3 in November, the flight team considered it to be the final choreography in the venerable probe’s multi-act grand interplanetary performance. By then, Dawn had already far exceeded all of its original objectives at Vesta and Ceres, and the last of the new scientific goals could be met in XMO3, the end of the encore. The primary consideration was to keep Dawn high enough to measure cosmic rays, meaning it needed to stay above about 4,500 miles (7,200 kilometers). There was no justification or motivation to go anywhere else. Well, that’s the way it was in November anyway. This is January. And now it’s (almost) time for a previously unanticipated new act, XMO4. This map of Ceres has all 114 feature names approved so far by the International Astronomical Union (IAU). (We described the naming convention here.) As more features are named, this official list and map are kept up to date. We saw an earlier version of this map before Dawn had flown to its lowest orbit and obtained its sharpest pictures. The dwarf planet is 1.1 million square miles (2.8 million square kilometers). That’s about 36 percent of the land area of the contiguous United States, or the combined land areas of France, Germany, Italy, Norway, Spain, Sweden and the United Kingdom. The scales for horizontal distance in this figure apply at the equator. Rectangular maps like this distort distances at other latitudes. While Dawn obtained pictures from near the line to the sun in its first Ceres orbit, there is a special importance to being even closer to that line. Let’s see why that alignment is valuable. A full moon occurs when the moon and sun are in opposite directions from Earth’s perspective. That alignment is known as opposition. That is, an astronomical body (like the moon or a planet) is in opposition when the observer (you) is right in between it and the source of illumination (the sun), so all three are on a straight line. And because the brightness takes such a steep and unexpected jump there, this phenomenon is known as the opposition surge. Dawn observed this scene inside Yalode Crater on Oct. 13, 2015, from its third mapping orbit at an altitude of 915 miles (1,470 kilometers). At 162 miles (260 kilometers) in diameter, Yalode is the second largest crater on Ceres. 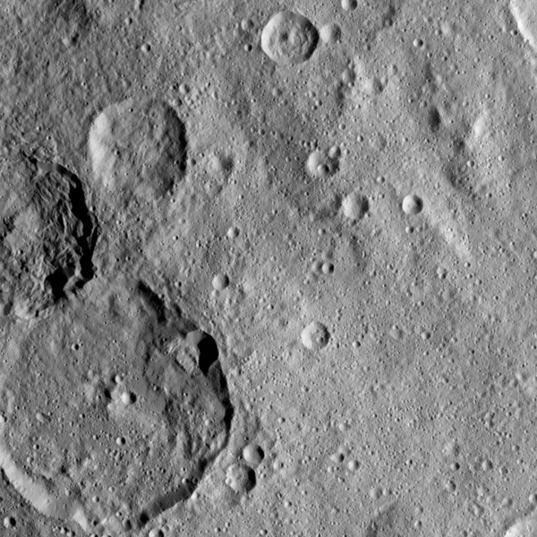 (Scientists expected to see much larger craters than Ceres displays.) 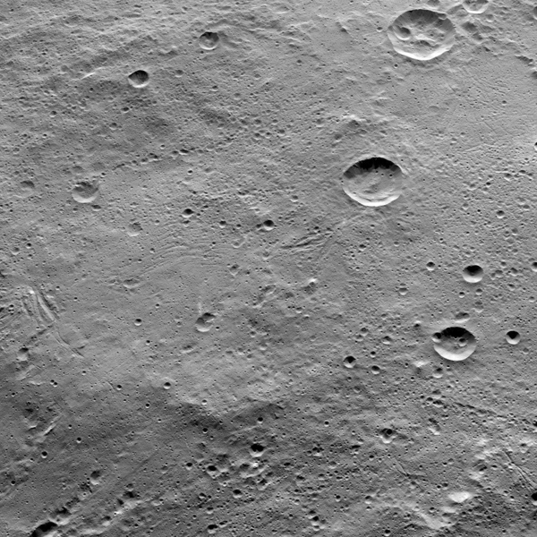 The two largest craters within Yalode are visible in this picture. Lono Crater, at top right, is 12 miles (20 kilometers) in diameter. (Lono is a Hawaiian god of agriculture, rain and other roles.) Below Lono is the 11-mile (17-kilometer) Besua Crater. (Besua is one of at least half a dozen Egyptian grain gods.) 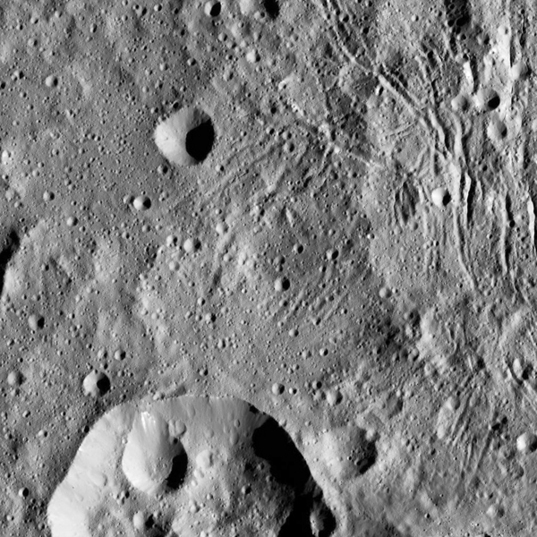 Note several chains of craters as well as fractures on the left and lower right. We saw a much more fractured area of Yalode, now named Nar Sulcus, here. (Nar is from a modern pomegranate feast in part of Azerbaijan. A sulcus is a set of parallel furrows or ridges.) You can locate this scene in the eastern part of Yalode on the map above near 45°S, 300°E. The photo below shows a more detailed view. You can see all of Yalode starting at 2:32 in the animation introduced here. Full image and caption. The observed magnitude of the opposition surge can reveal some of the nature of the illuminated object on much, much finer scales than are visible in photos. Knowing the degree to which the reflection strengthens at very small angles allows scientists to ascertain (or, at least, constrain) the texture of materials on planetary surfaces even at the microscopic level. If they are fortunate enough to have measurements of the reflectivity at different angles for a region on an airless solar system body (atmospheres complicate it too much), they compare them with laboratory measurements on candidate materials to determine which ones give the best match for the properties. Dawn has already measured the light reflected over a wide range of angles, as is clear from the figure above showing the orbits. But the strongest discrimination among different textures relies on measuring the opposition surge. That is Dawn’s next objective, a bonus in the bonus extended mission. You can see from the diagram that measuring the opposition surge will require a very large change in the plane of Dawn’s orbit. Shifting the plane of a spacecraft’s orbit can be energetically very, very expensive. (We will discuss this more next month.) Fortunately, the combination of the unique capabilities provided by the ion propulsion system and the ever-creative team makes it affordable. Dawn had this view on June 7, 2016, from its fourth mapping orbit. Taken at an altitude of 240 miles (385 kilometers), this picture shows greater detail in a smaller area than the picture above. Part of Lono Crater is at the bottom. Full image and caption. Powered by an insatiable appetite for new knowledge, Dawn will begin ion thrusting on Feb. 23. After very complex maneuvers, it will be rewarded at the end of April with a view of a full Ceres from an altitude of around 12,400 miles (20,000 kilometers), about the height of GPS satellites above Earth. (That will be about 50 percent higher than the first science orbit, which is labeled as line 1 in the figure.) There are many daunting challenges in reaching XMO4 and measuring the opposition surge. Even though it is a recently added bonus, and the success of the extended mission does not depend on it, mission planners have already designed a backup opportunity in case the first attempt does not yield the desired data. The second window is late in June, allowing the spacecraft time to transmit its findings to Earth before the extended mission concludes at the end of that month. Occator Crater is shown in this mosaic of photos Dawn took at its lowest altitude of 240 miles (385 kilometers). The central bright area, Cerealia Facula, is the prime target in the planned opposition surge measurements. Dawn’s infrared spectra show that this reflective material is principally sodium carbonate, a kind of salt. We described more about this mosaic here. For other views of Occator and its mesmerizing reflective regions, follow the links in the paragraph below. Full image and caption. For technical reasons, the measurements need to be made from a high altitude, and throughout the complex maneuvering to get there, Dawn will remain high enough to monitor cosmic rays. Ceres will appear to be around five times the width of the full moon we see from Earth. It will be about 500 pixels in diameter in Dawn’s camera, and more than 180,000 pixels will show light reflected from the ground. Of greatest scientific interest in the photographs will be just a handful of pixels that show the famous bright material in Occator Crater, known as Cerealia Facula and clearly visible in the picture above. Scientists will observe how those pixels surge in brightness over a narrow range of angles as Dawn’s XMO4 orbital motion takes it into opposition, exactly between Occator and the sun. Of course, the pictures also will provide information on how the widespread dark material covering most of the ground everywhere else on Ceres changes in brightness (or, if you prefer, in dimness). But the big reward here would be insight into the details of Cerealia Facula. Comparing the opposition surges with laboratory measurements may reveal characteristics that cannot be discerned any other way save direct sampling, which is far beyond Dawn’s capability (and authority). For example, scientists may be able to estimate the size of the salt crystals that make up the bright material, and that would help establish their geological history, including whether they formed underground or on the surface. We will discuss this more in March. Most of the data on opposition surges on solar system objects use terrestrial observations, with astronomers waiting until Earth and the target happen to move into the necessary alignment with the sun. In those cases, the surge is averaged over the entire body, because the target is usually too far away to discern any details. Therefore, it is very difficult to learn about specific features when observing from near Earth. Few spacecraft have actively maneuvered to acquire such data because, as we alluded to above and will see next month, it is too difficult, especially at a massive body like Ceres. The recognition that Dawn might be able to complete this challenging measurement for a region of particular interest represents an important possibility for the mission to discover more about this intriguing dwarf planet’s geology. Meeting the scientific goal will require a careful and quantitative analysis of the pixels, but the images of a fully illuminated Ceres will be visually appealing as well. Nevertheless, you are cautioned to avoid developing a mistaken notion about the view. (For that matter, you are cautioned to avoid developing mistaken notions about anything.) You might think (and some readers wondered about this in a different phase of the mission) that with Dawn being between the sun and Ceres (and not being a vampire), the spacecraft’s shadow might be visible in the pictures. It would look really cool if it were (although it also would interfere with the measurement of the opposition surge by introducing another factor into how the brightness changes). There will be no shadow. The spacecraft will simply be too high. Imagine you’re standing in Occator Crater, either wearing your spacesuit while engaged in a thrilling exploration of a mysterious and captivating extraterrestrial site or perhaps instead while you’re indoors enjoying some of the colony’s specially salted Cerean savory snacks, famous throughout the solar system. In any case, the distant sun you see would be a little more than one-third the size that it looks from Earth, comparable to a soccer ball at 213 feet (65 meters). Dawn would be 12,400 miles (20,000 kilometers) overhead. Although it’s one of the largest interplanetary spacecraft ever to take flight, with a wingspan of 65 feet (20 meters), it would be much too small for you to see at all without a telescope and would block an undetectably small amount of sunlight. It would appear smaller than a soccer ball seen from 135 miles (220 kilometers). Therefore, no shadow will be cast, the measurement will not be compromised by the spacecraft blocking some of the light reaching the ground and the pictures will not display any evidence of the photographer. Dawn took this picture on Oct. 21, 2016, in its fifth observation orbit, at an altitude of 920 miles (1,480 kilometers). The two largest craters here display very different kinds of topography on their floors. The larger, Jarimba, is 43 miles (69 kilometers) across. (Jarimba is a god of fruit and flowers among the Aboriginal Aranda of central Australia.) Above Jarimba is part of Kondos Crater, which is 27 miles (44 kilometers) in diameter. (Kondos is a pre-Christian Finnish god of sowing and young wheat.) This scene is centered near 21°S, 27°E on the map above. Full image and caption. Even as the team was formulating plans for this ambitious new campaign, they successfully dealt with a glitch on the spacecraft this month. When a routine communications session with the Deep Space Network began on Jan. 17, controllers discovered that Dawn had previously entered its safe mode, a standard response the craft uses when it encounters conditions its programming and logic cannot accommodate. The main computer issues instructions to reconfigure systems, broadcasts a special radio signal through one of the antennas and then patiently awaits help from humans on a faraway planet (or anyone else who happens to lend assistance). The team soon determined what had occurred. Since it left Earth, Dawn has performed calculations five times per second about its location and speed in the solar system, whether in orbit around the sun, Vesta or Ceres. (Perhaps you do the same on your deep-space voyages.) However, it ran into difficulty in those calculations on Jan. 14 for the first time in more than nine years of interplanetary travel. To ensure the problematic calculations did not cause the ship to take any unsafe actions, it put itself into safe mode. Engineers have confirmed that the problem was in software, not hardware and not even a cosmic ray strike, which has occasionally triggered safe mode, most recently in September 2014. Mission controllers guided the spacecraft out of safe mode within two days and finished returning all systems to their standard configurations shortly thereafter. Dawn was shipshape the subsequent week and resumed its scientific duties. When it activated safe mode, the computer correctly powered off the gamma ray and neutron detector, which had been measuring the cosmic rays, as we described above. The time that the instrument was off will be inconsequential, however, because there is more than enough time in the extended mission to acquire all the desired measurements. The extended mission has already proven to be extremely productive, yielding a great deal of new data on this ancient world. But there is still more to look forward to as the veteran explorer prepares for a new and adventurous phase of its extraordinary extraterrestrial expedition. Dawn is 5,650 miles (9,100 kilometers) from Ceres. It is also 2.87 AU (266 million miles, or 429 million kilometers) from Earth, or 1,135 times as far as the moon and 2.91 times as far as the sun today. Radio signals, traveling at the universal limit of the speed of light, take 48 minutes to make the round trip. Hi Dr. Marc, Will there be an opportunity in the new orbit to observe Ceres backlit by the Sun? 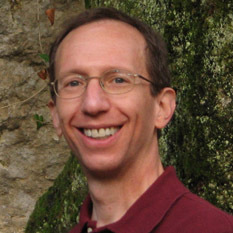 Hi Marc; I appreciate your answers and reports and am glad you are accessible to answer questions from myself and other Planetary Society members. I just read on the SETI web site an article about Ceres with the title Observations of Ceres indicate that asteroids might be camouflaged at least partly written by Frank Marchis about results from the SOFIA observatory. The part about Ceres' surface perhaps being deceiving in that it has much material not native to it but that has instead fallen on it from space perhaps from other asteroids I understand. However they are saying, and it was my understanding from before, that Ceres had been thought of the largest example in the asteroid belt of Carbonaceous Chondrites due to organics and carbonates on its surface. It seems that this is a lot of the material that could be from elsewhere. They mention that a significant part of the carbonaceous material is in the form of clays but this is where I run into problems with the terms and I would appreciate your help. This article mentions hydrous dust but it also mentions watery clays and it mentions ammoniated clays and it mentions anhydrous pyroxene-rich dust. My question to you as a specialist on Ceres is whether the hydrous dust is the same as the watery clays and whether the anhydrous pyroxene-rich dust is the same or at least includes the ammoniated clays. I would also be interested to know if these hydrous and anhydrous dust make up most of what was or is considered to be the organic material on the surface of Ceres and whether these dusts or clays with the carbonates make up what would make Ceres to qualify as a carbonaceous chondrite asteroid. Thank you for your dedication to the Dawn mission and informative and enthusiastic reporting on its mission to Ceres and I am looking forward to your answers to these questions to try to sort out what class of asteroid Ceres might be now considered more intrinsically. Hi Marc, I was reading about your efforts to utilise Dawn at other asteroids, and today I've been playing with David Rankin's excellent asteroid orbit viewer: I noticed that the PHA 2000 GV147 (Earth MOID 0.002283 AU) will be making a relatively slow, close pass of Ceres during the latter half of this year. This is because the relevant orbital elements are quite similar (i=10.56, ascending Node= 68.7) I'm wondering if you might be able to gain some opportunistic observations during the pass and I'm curious what the dV would be for Dawn to make the jump to 2000 GV147 - could it do it? Hi Atom, I am sorry for this tardy reply. I hope you see it. In our first science orbit, we did photograph Ceres when it was mostly backlit. That is, referring to my diagram above of the orbits, we took pictures along the far right of line #1, where it has extended off the figure. (For more about this orbit, search the blogs for "Emboldawned.") We have analyzed those data in detail, and the consensus is that further photography with Ceres backlit is not worth the risk of pointing the camera near the sun. Now you might think that in its next orbit, Dawn will go into Ceres' shadow, in which case the spacecraft could photograph Ceres fully backlit, without risk to the camera. That sounds reasonable, but for reasons I will explain in a future Dawn Journal, that won't happen. Dawn will not enter the shadow. The orbit will have a surprising property in which Dawn will fly exactly between the sun and Ceres but then will not be on that same line 180 degrees later in the orbit. dougforworldsexplr: Thanks for your nice comment! While I was out of town with almost no Internet access, I asked a colleague to look at your questions and the press release you read so I could provide a response promptly upon my return. She noted that the hydrous dust, watery clays, and ammoniated clays are all the same. In addition, Dawn's spectrometers cannot tell us if there are clays without ammonia, so it's not clear why the press release differentiates ammoniated clays from watery clays. The carbonaceous classification of asteroids is based on the similarities to the spectral properties of carbonaceous chondrites, which are rich in carbonates and organics. However, these materials have been very difficult to find on C-type asteroids. 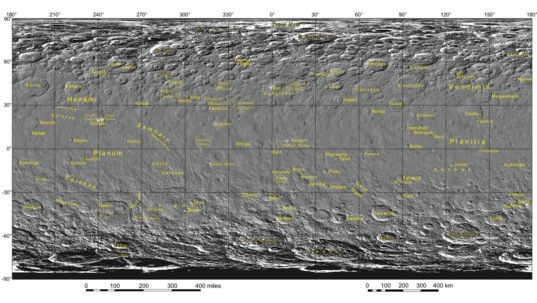 In fact, carbonates have been discovered only on Ceres. Organics have been detected on only a very small number of bodies in the asteroid belt. (Of course, more detections may be reported.) One explanation for why Ceres and the smaller C-type asteroids are so dark is the effect of radiation on organic materials (known as graphitization). Therefore, Dawn's detailed studies of Ceres' mineralogy seems to show that it is related to some kinds of carbonaceous chondrites, particularly those that have been subjected to significant aqueous alteration. In contrast, the very fine anhydrous dust seems to come from another object that has not experienced aqueous alteration. Hi Mike, To answer your question, one of the trajectory experts on my team looked into this. 2000 GV147 will make its closest approach to Ceres in October at a range of 0.11 AU (10 million miles, or 16 million kilometers). But 2000 GV147 is very small, only about 0.3 miles (0.5 kilometers) in diameter. Dawn would not even be able to detect this tiny body at such a long distance, much less perform any productive observations. For context, even at 3,000 miles (5,000 kilometers), this asteroid would be only one pixel in Dawn's camera (and still smaller in the spectrometers). He determined that Dawn does not have the capability to reach 2000 GV147. It would require more xenon propellant than we have left onboard. If we ignore the impossibility of getting there and invoke one (but only one) magical solution that would provide Dawn with the requisite capability, there would still be some quite significant challenges with the encounter. Despite what appears to be a slow flyby, the relative velocity would be almost 12,000 mph (nearly 19,000 kilometers per hour). For such a small body, that would present several problems, and the encounter would be unlikely to yield very much. H Marc, Can you comment upon the recent organics revelation? Will the most recent mission campaigns be able to add anything further? Hi Marc, Thank you for the detailed response! I must admit a SF-themed ulterior motive for the question, in that I'm trying to get a feeling for the kinds of transits that manned craft might make in the future - supposing that there are human colonies distributed throughout the belt. Rather than spending months in dV-optimised cruise phases, I'd predict that people will prefer to "hop" asteroid to asteroid so they almost always have access to resources and radiation shelter (even if it costs a little extra dV). Manned craft will have greater propulsive capabilities than Dawn, but also greater mass, which makes me think these considerations are comparable. 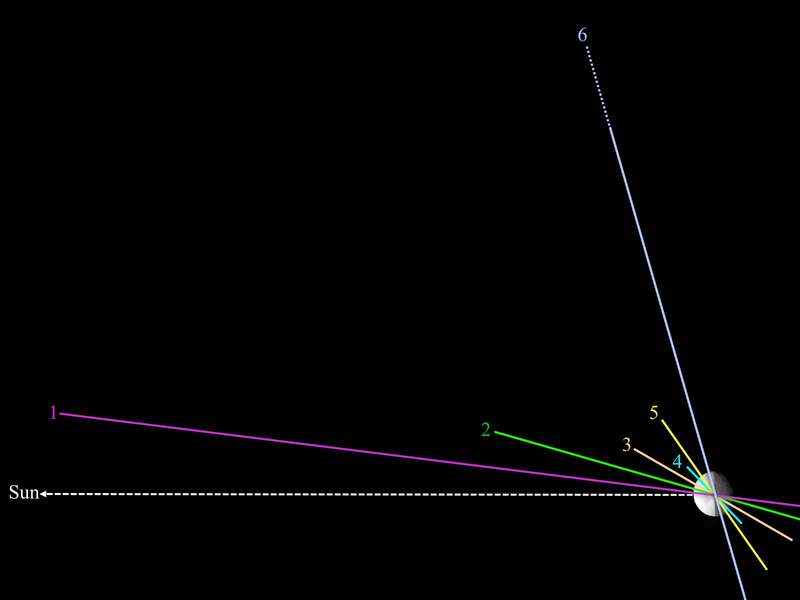 If the flyby velocity is over 5km/s, then the dV to make the "hop" must be at least that much (!) not even accounting for the (still quite lengthy) time of transit to cross those 16 million km (42 LD). Suffice to say, even if you're willing to spend a little extra dV to avoid long transits, encounters between minor planets/asteroids will need to be far slower and closer than this one. Thanks again.